Such a risky approach seems like it would be more literature than history — and certainly Wayward Lives, Beautiful Experiments overflows with beautifully crafted prose — but if the purpose of history is to familiarize us with the past without deception, then I feel this book qualifies in a way that thrills and enlightens. The 64 pages of footnotes are a treasure trove of literature, history, and sociology, and I loved the period black-and-white photographs that mesh thematically with the prose. Just a generation after the end of slavery, dangers lurked for young black women. Early on we are introduced to a prepubescent girl posed like an odalisque for the creepy camera of Thomas Eakins, but older women were threatened as well. The demographics required that black women work, but the only jobs available to them (even in the supposedly progressive cities of Philadelphia and New York) consisted of domestic work of cleaning and laundry. Yet, these girls had aspirations for greater lives, and if not freedom in their working lives, then rebellious freedom in their social lives. “Owning nothing and subsisting on so little, they let the heart decide everything. 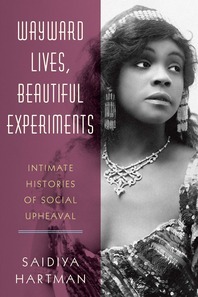 Love was their only anchor.” (page 147) For black women, there were men, of course, but many of the most interesting stories in Wayward Lives, Beautiful Experiments involve women who explored the alternatives. Within its pages we meet the lesbian and cross-dressing Jackie Mabley and Gladys Bentley, and in one of my favorite parts of the book, we follow the early education and growth of Mabel Hampton, who became a prominent lesbian activist and archivist, and who lived until 1989. Minors didn’t come under the purview of the laws that applied to adults, so they did not have due process and could be sent to the correctional facility at Bedford Hills for an “indeterminate” sentence. Bedford Hills still exists as a maximum security prison for women, but a hundred years ago it was the site of brutality and torture, where after a two or three year sentence “the black women were sent to white homes in upstate New York and forced to labor as live-in domestics.” (page 266) Another wonderful passage in Wayward Lives, Beautiful Experiments describes a riot at Bedford Hills during which the prisoners made as much noise as possible. There are several famous and semi-famous historical figures that make an appearance in Wayward Lives, Beautiful Experiments, but the real power of this book is its elevation of the virtually anonymous to become heroes and explorers of new ways of living.